The world's first commercial jet part-powered by a new form of biofuel touches down in London on Wednesday (3rd October). The Virgin Atlantic Boeing 747 uses a biofuel that blends conventional jet fuel with bioethanol made from industrial waste gases - a fuel that could revolutionise air travel. 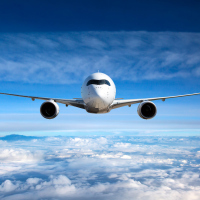 Sir Richard Branson, the airline's founder, said that in an age when long-haul travel is more important than ever in connecting people around the world it is the airlines' responsibility to ensure they are doing so in the most sustainable way possible. Sir Richard was even planning to be on hand at London Gatwick to celebrate the occasion, guiding the aircraft back to the stand after it touched down following its long-haul flight from Orlando, Florida. The firm that produces the fuel blend, LanzaTech, believes it has the potential to meet around a fifth of the current commercial global aviation fuel demand. It says it delivers a reduction in greenhouse gas emissions of "at least 65%" compared with conventional petroleum fuel. Virgin Atlantic is calling on the Government to commit to supporting LanzaTech's bid to open three UK plants by 2025, producing up to 125 million gallons of "sustainable fuel" per year. Sir Richard said: "Working with LanzaTech will enable us to drastically reduce our carbon emissions and at the same time help support UK industry. "That's why we're so excited to showcase this fuel on its first commercial flight as we plan for the world's first full-scale jet fuel plant using this amazing new technology." LanzaTech chief executive Jennifer Holmgren said: "We have shown that recycling waste carbon emissions into jet fuel is not impossible, that waste carbon needs to be thought as an opportunity not a liability, that carbon can be reused over and over again." If you're planning a trip across the Atlantic to Florida, check out our dedicated Florida travel insurance and give yourself peace of mind the next time you hit the Sunshine State.